Used as a prayerbook as well as a book of hymns for church services, the psalter in the later middle ages was often produced with a calendar and additional prayers. Eventually it was combined with an abridged version of the breviary, the prayerbook used by monks, to form the special lay prayerbook, the book of hours. This psalter represents an important stage in this development as it took place in England. It is one of the earliest psalters to include the Hours of the Virgin, a special set of devotions taken from the breviary. Also it is the earliest of a line of richly decorated psalters which were probably made at Oxford, in the workshops by lay scribes and artists, an industry which grew out of book production for the university. Psalters, like books of hours, could be passed down, and many were augmented with later inscriptions and even images. About 1240, this half-page picture of the image created on the veil of St Veronica when she wiped Jesus' face with it as he was carrying the cross, with a prayer. 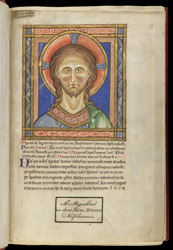 The prayer and image were frequent additions to prayerbooks beginning about this time. It was believed that recitation of the prayer before the picture would gain the viewer an indulgence, or release from a certain number of days in purgatory. The image from the veil is idealised, without the wounds from the crown of thorns, and is framed with a border of ornament and gold.